Adhel* lost her husband and one of her children earlier this year when the Sudanese Armed Forces, or SAF, bombed her town in South Kordofan. “It’s a mess, many people were captured, others scattered, others came here, and others killed.” The Sudan People’s Liberation Movement-North, or SPLM-N, were not present in her town during the attacks. Now “the child inside her womb has no father,” said the Nuba translator. Since fighting between the SAF and the SPLM-N started in South Kordofan almost a year and a half ago, the stories of displacement by aerial bombardment, food shortages, and militia attacks that refugees tell remain the same. A new influx of refugees to South Sudan is expected when the dry season begins, at which point fighting tends to escalate and roads become passable. Yida refugee camp is situated about a stone's throw away from the border with Sudan. While the number of new refugees entering the camp has decreased from its highest levels during the summer, the camp receives new arrivals daily. Abuk, another recent arrival to Yida, described how her town of Um Dulu experienced frequent aerial attacks. She described occasions during which the SAF bombed from the air while ground forces hid in the river and shot civilians from there. Abuk had stayed in her village because she thought the security situation would improve. She managed to flee with her children by vehicle to Yida but said that people in her village were without medicine and some were dying from hunger. While Yida camp enjoys a flourishing market and a well-organized community, the lack of clarity over the status and permanence of the camp poses a challenge. Yida is currently considered a transit camp by the U.N. refugee agency rather than a refugee camp because of its proximity to the border and the resulting security issues. The “transit camp” label means that schools are not provided for the hundreds of school-age children in the camp. In November 2011, the camp was bombed by the Sudan government; fighting in the border areas has also come dangerously close. But the refugee population has largely been adamant about staying in Yida since the camp first emerged; the search for alternative sites continues. The militarization of the camp has also been a constant concern; the movement of soldiers both from the SPLA-N and South Sudan’s army is difficult to control. 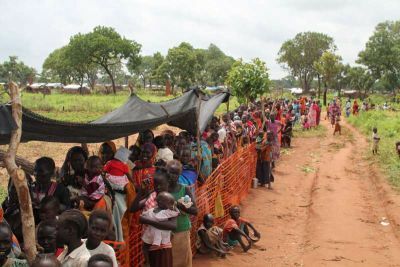 A disarmament process last month reportedly involved not only the removal of arms but also men from the camp, prompting speculation that the initiative was actually a recruitment process for the SPLM-N. One U.S. official said that the U.S. government’s message to the SPLM-N has been to resist recruiting from within the camp. Additionally, the delivery of food to Yida via airdrops appears unsustainable. Since September, the World Food Program has airdropped food aid to the camp since the rains have prevented the delivery of food by road. One possible way to avoid future airdrops—and the exorbitant associated price—is to preposition food during the dry season for people in the camp and possible new arrivals. This, however, does require a relatively firm estimate of the number of new arrivals and the political will among donors to invest significant resources early. Despite the politics and challenges of this community and the ongoing violence in South Kordofan forcing people to abandon their homes, there remains a strong desire and hope among the camp’s residents that the situation in South Kordofan will be resolved and they will be able to return home. * All names in this blog post have been changed.